Eddie Masaya was born in l960 in the mountainous Nyanga district of Zimbabwe. Whilst at school he came across a magazine, The African Times, in which there was a story featuring the activities of a group of sculptors, they were Claud Nyanhongo, Bernard Manyandure and Moses Masaya. It was through this article that he came to know that his cousin, the acclaimed first generation sculptor Moses Masaya - was actually a sculptor. After reading the magazine and almost being possessed by the work he saw, he made his mind up that once he was finished school he would journey to Harare and ask his cousin to teach him how to sculpt. 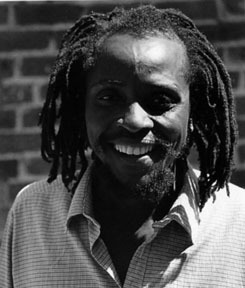 In 1980 true to his desires Masaya left Nyanga and went to stay with his cousin in Harare, where he spent the next two years. In this formative period he learnt a lot from Moses, how to use the tools correctly, how to polish a piece so it shines like a mirror but most importantly how to respect the stone and work with its flaws and textures, a factor which is still evident in his work today. In 1981, together with Moses they held an exhibition at the John Boyne gallery in Harare, it was here Masaya first met Mr. Roy Guthrie who was a visitor to the show and the two have maintained contact ever since. 1982 saw Eddie leave his cousins' studio and join Brighton Sangoin Guruve, it was the start of a close friendship and working relationship that was to last until Sango's tragic death in 1995. Common goals had been established and Masaya was able to find his own expression, he says of that time "As a beginner I wanted to achieve perfection in the finish of my pieces, I wanted them to be smooth and shiny. There (in Guruve) I found my self moving away from that approach and beginning to explore rougher forms and contrasting textures". Personal re - evaluations of the possibilities within stone sculpture are stilL evident in both their work. These young sculptors along with Tapfuma Gutsa and Norbert Shamuyarira, were the first to start to break away from the traditions set in place by the first generation. Masaya's work possess a strange, ghostly quality and this, perhaps more than anything else, links him, more than the others, to the first generation artists. A break through exhibition was held in 1991 at the Alliance Francais in Harare titled A New Generation and it featured the works of Eddie Masaya, Tapfuma Gutsa, Brighton Sango and Norbert Shamuyarira. They response was outstanding as people redefined their concepts of Zimbabwean stone sculpture. Masaya has gone from strength to strength continually propelling himself to new heights. In 1995 he joined the artist residence program at Chapungu Sculpture Park, due to the outstanding excellence of his work he was awarded invited artist status in February of this year. Masaya's spiritual approach to sculpting is confidently depicted in his recent work The Wise Man, here one can see the serenity and contentment within a man who has acquired the gift of wisdom. The two faces, back to back, symbolic of his spiritual and physical attributes. Masaya's work has been exhibited internationally since the mid - Eighties and he continues to present individual strength and direction.